When you think of Nikon, the first thing that will probably come to mind is a Camera. The company has been making different kinds of cameras for many decades. In fact, the success of Nikon in the camera manufacturing industry comes second to none. But, what you might not know is that they are also a top and highly reputable golf rangefinder manufacturer. Nikon has been in the rangefinder manufacturing business for longer than most golfers know because the company was previously making rangefinders for Callaway before they started manufacturing them under their own brand name. Their many years of experience in making optics for cameras is what drove them to the rangefinder business and they are slowly emerging as one of the top golf rangefinder manufacturers. Although there are many things that seem to set Nikon apart from many other brands when it comes to rangefinders, the easy to use design and a more affordable price tag of their products is what many golfers love most. Also, their rangefinders are designed to be compact and highly portable, and with some outstanding features like First Target Priority, Vibration Reduction System, ID Technology for slope compensation, 8-Second Continuous Measurement, and Long Eye Relief. High accuracy: When you want to take some precise distance measurements on the course, you can always rely on Nikon rangefinders. They make use of top technologies like Fast Target Priority, ID Technology, Vibration Reducing System and top-notch optics to ensure you get accurate and reliable measurements. Affordable: While it is true there are some Nikon rangefinders that will cost upwards of $400, most of their rangefinder models are designed to be more affordable. Generally, their rangefinders are more affordable than what you get from most other top brands. Easy to use: You do not have to struggle to try to figure out how to use a Nikon rangefinder as they are all designed to be straightforward to use even for beginner golfers. For example, the Nikon ACULON AL11 only has one button for simple operation. Weatherproof: Nikon makes their rangefinders to be ideal for use in any weather, and they feature a sturdy body with some top quality seals to make them resistant to water, fog and many other elements. Small and Lightweight: Most Nikon rangefinders are designed to be small, compact and lightweight to make them easy to carry around the course for extended periods. Not as feature-rich: Although most Nikon rangefinders have some amazing features, they are still not as feature-rich, and hence also not as high-performing as other top golf rangefinder brands like Bushnell. Limited Choice: While most other top golf rangefinder brands have dozens of rangefinder models to pick from, Nikon does not offer as many options, and this limits a golfer’s option. 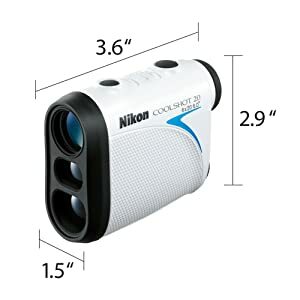 Nikon Coolshot 20 and 20i are two of the most affordable golf laser rangefinder by Nikon, and if you are shopping on a tight budget they are the best models for you. But, despite the more affordable price tag, both are still feature-rich, high-performing and accurate which is just what a golfer wants in a rangefinder. Both laser rangefinders will feature First Target Priority, 8-Second Continuous Scanning, 6-550 yard range and Long Eye Relief. Also, both are small and compact rangefinders with a weatherproof construction to make them ideal for use in any weather. The Slope-Adjusting ID technology on the Coolshot 20i is one of the key elements that set the two rangefinders apart because the Coolshot 20 does not adjust for the slope. Also, Coolshot 20i has a unique Glass and Multicoating Tech that is common in Nikon cameras, and it is designed to ensure a more natural and clearer view. First Target Priority: Revolutionary technology that ensures you get the distance readings to the closest targeted object in a group of many objects. Continuous Scanning: An outstanding feature that allows the rangefinder to continuously range for 8 seconds to give you measurements of small or thin objects which can be very handy when trying to tell the distance to trees, mounds, pins, and hazards. Range: Nikon Coolshot 20 provides a range of 6 to 550 yards and will measure in both yards and meters. Long Eye Relief: Long eye relief makes it gentler on your eyes and also keeps it eyeglass-friendly to ensure that anyone can use it. Weatherproof: Rainproof construction makes this a perfect all-weather rangefinder. Slope Adjusting ID Technology: The key feature that sets the Coolshot 20i apart from the Coolshot 20, and it provides downhill or uphill shots that are adjusted for the slope to ensure more accuracy. The advanced slope ID technology makes it easy to select the right club so that you can hit the balls at the right trajectory. Nikon Glass and Multicoating Tech: Another impressive technology that is designed to ensure that you get a clearer and more natural view by minimizing the loss of light that results from reflection. First Target Priority: A handy feature that will ensure the rangefinder only displays the distance to the nearest target from the many results that are obtained. Long Eye Relief: Designed to provide a comfortable enough and clear view particularly for golfers that wear eyeglasses. Continuous Measurement: 8-second continuous measurement helps make it easy to measure distances to small or thin objects and also to multiple objects. With this feature, golfers get the ability to scan the green and pick out the flag from the background. 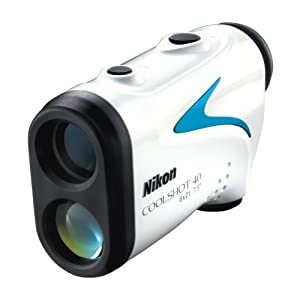 For golfers that do not mind spending a little more on their golf rangefinder, the Nikon Coolshot 40 or 40i will be a great pick. These are more advanced and feature-rich rangefinders than the Coolshot 20 series with a slightly longer range of 8-650 yards. The rangefinders have the Hyper Read technology that will provide distances in just 0.5 seconds, 8-second Continuous Measurement to allow for quick measurement of multiple or tiny objects, First target Priority and 18mm Long Eye Relief. However, Coolshot 40i has the advanced ID technology that will compensate for the uphill or downhill slope for more reliable distances. Although this slope compensating feature is very useful, it means that unlike the Coolshot 40 the 40i model it is not tournament legal. Hyper Read: One of the most outstanding features of the Coolshot 40, and it is designed to ensure that you always get measurements super fast. And this is regardless of the distance. Ranging Capability: This rangefinder provides a range of 8 to 650 yards in 1/2-yard increments, and it will measure in both meters and yards while maintaining an accuracy of +/- 0.75 yards. Continuous Measurement: With a single push and hold of the button, you can continuously measure the range for up to 8 seconds to allow for quick measurement of multiple objects. First Target Priority: A handy feature that ensures you only get the distance to the first target from the numerous results obtained. Long Eye Relief: With its incredible 18mm eye relief, Coolshot 40 will always give you an easy and comfortable view. ID Technology: An outstanding technology that will ensure that your uphill or downhill shots are compensated for the slope. With this advanced ID technology, you also get to-the-target distances to make it easy to choose the ideal club for all your downhill and uphill shots. Hyper Read: Also an impressive feature that ensures you get extremely fast distance measurements as it only takes the rangefinder 0.5 seconds to display any distance. Range: Like the Coolshot 40, the 40i also has a range of 8-650 yards and with a +/- 0.75 yards accuracy. Continuous Measurement: 8-second continuous scanning will make it easy to get measurements for the small or tiny objects and also for multiple objects which makes it easy to pick out the flagstick. Rainproof: Weatherproof construction makes this the perfect rangefinder for use in any weather. 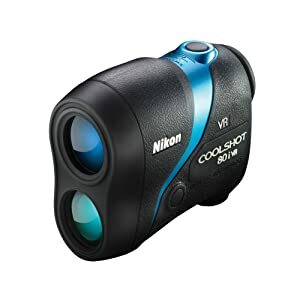 Coolshot 80 VR and 80i VR are some of the most feature-rich and technologically advanced laser rangefinders by Nikon. Although they also cost more than most of their other models, they are worth every buck you spend on them thanks to their top-notch performance. The key highlight of these rangefinders is the Vibration Reducing Technology that is designed to minimize the vibrations caused by hand movements for faster and more precise ranging. Also, both have the Locked-On technology, 8-Second Continuous Vibrations, wide field of view and bright optics, long eye relief and an all-weather construction. The point of departure between the two rangefinders is that the 80i VR has a selectable slope compensating feature. And so it will not only provide distances that are compensated for downhill or uphill slope but you can also turn it off to make this a tournament legal device. Vibration Reducing System: The Optical VR Tech is at the heart of the Coolshot 80, and it will ensure that you get more accurate distances from anywhere in the course by reducing hand vibrations by up to an impressive 80%. Also, it ensures more precise and faster ranging by aligning the activated laser beam with the image. Locked On Tech: This technology makes use of fast target priority mode to ensure that golfers know when they are reading the distances to the flagstick and not other things behind or around it. Continuous Measurement: A typical Nikon rangefinder feature that makes it easy for golfers to quickly and effortlessly plan their shots. All-Weather Construction: With an O-ring sealed body, this rangefinder is designed for use in any weather as the nitrogen purged seal makes this device both fogproof and waterproof. ID Technology: The selectable slope compensation feature on the Coolshot 80i VR makes it possible for golfers to get distances that are compensated for downhill and uphill slopes to eliminate guesswork when it comes to club selection. But, what sets the 80i VR apart from other Nikon rangefinder with ID technology is that the feature can be turned off to make it tournament legal. Continuous Measurement: The feature to always turn to when you want to get distances to small or tiny objects and multiple objects, and it is a highly useful feature when you want to tell the distances to the hazards, mounts, pins or trees. Vibration Reducing System: Minimizes the vibrations caused by the hand movements and allows for fast and precise ranging. Long Range: With a range of 8-1000 yards at 0.5-yard increments, this rangefinder offers one of the longest laser rangefinder ranges. 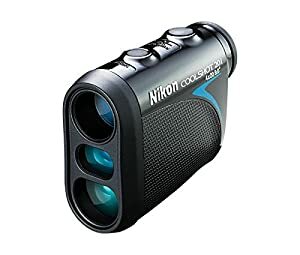 More advanced Nikon Coolshot rangefinder with exclusive Stabilization Technology designed to minimize vibration for more precise and fast ranging. Also, like most other top-notch golf rangefinders, it also has the ID technology that allows you to get slope compensated downhill and uphill distances. Also, this feature can be turned off to make the rangefinder tournament legal. Coolshot Pro Stabilizer also features Locked-On 2 technology to give you some assurances that you are getting measurements to the flagstick, Hyper Read Display, Actual Distance Indicator, and 8-Second Continous Measurement. And with this compact and lightweight rangefinder, you will get an impressive range of 8-1,200 yards. Stabilized Tech: Nikon’s optical stabilization system is the key highlight of this rangefinder, and it is designed to minimize the vibrations caused by hand movement by up to 80% for precise and fast ranging. ID Technology: The selectable ID Technology allows you to get distances that have been compensated for slope or elevation to guide you when choosing clubs for each shot. Hyper Read Display: By consistently displaying the measurement in just 0.3 seconds, this rangefinder will ensure faster play as you never have to waste time waiting for distance measurement. Locked-On 2 Tech: You can always be sure that the measurements that you are getting with this rangefinder are to the flagstick and not the trees in the background thanks to the Locked On technology that tells you the distances that you are getting are to the first target. Range and Accuracy: This is a long-range golf rangefinder that can measure 8-1,200 yards with an accuracy of 0.75 yards when inside the 700-yard mark and 1.25 yards when you are measuring beyond 1,000 yards. 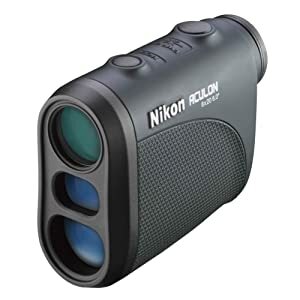 Nikon ACULON AL11 is a highly affordable compact and lightweight rangefinder that is designed for golfers shopping on a tight budget but still want something highly reliable. 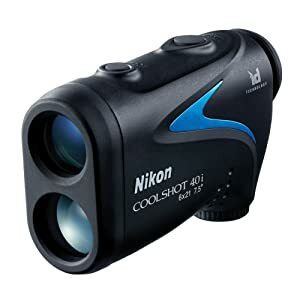 This high-quality rangefinder features multilayer coatings designed to provide a clear and more natural view. The device also features a convenient single button operation, simple to read display, long eye relief and an ultra-compact and portable design. Also, with this rangefinder, you get a range of 6-550 yards with 1-yard intervals. Multilayer Coatings: Multilayer coatings on this rangefinder are designed to provide a clearer and more natural view by minimizing the loss of light that results from reflection. Single Button Operation: With a simple-to-use single button for operation, this-rangefinder is designed to make measurements fast and easy, and it will also power down the device after 8 seconds to conserve the battery. Long Eye Relief: The high eyepoint design provides a clear and full field of view for all golfers when ranging, and it will be ideal even for those with eyeglasses. Measurement Range: It has a medium range of 6-550 yards which is still quite good given its size and price range. 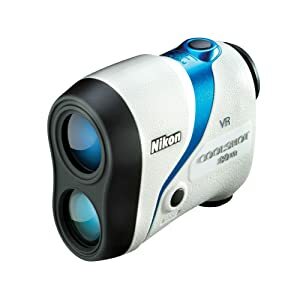 Nikon has been making optics for cameras for close to a century now and given the fact that they have also been manufacturing rangefinders for companies like Callaway for a long time, you can be confident that they know everything that there is to know about these handy golf devices. Like most other companies, they are also always improving their rangefinder models by adding more advanced features and enhancing the design to make them even better for golfing. And given that they also have several models in different price ranges and with different capabilities, they also try to cater to all kind of golfers. 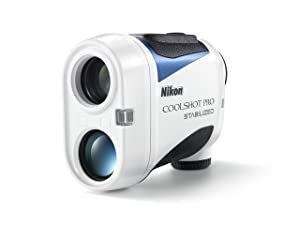 And so the bottom line is that if you are on the market for a top quality golf rangefinder that is feature-rich and from a reputable brand, Nikon will be an excellent choice.